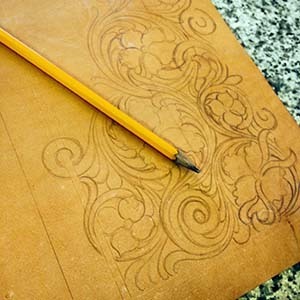 There are many different ways to accomplish the same thing in leather work. Sanding is no different. There are antique line finishers, who’s sole purpose is to sand and burnish any leather edge to a high gloss finish… particularly on shoes and boots. But these machines are heavy and take up a lot of room in a workshop. There are cabinet finishers that take up much less room and do just as good of a job. But finding one of these on the used market can be difficult… most folks won’t part with them. There are even other “powered” machines used in other industries that can accomplish your sanding needs. But if you are just starting out in leathercraft, you are most likely very mindful of where your budget dollars are best spent on tools. An investment in a power sander of some sort just may not be in the cards at the moment. Do not let this bother you. I have had power sanders in the past in my shop and yes they did save a lot of time. But as of today, I simply do not have the room for one. For the last few years, I have been sanding all of my edges by hand using easy to find sanding tools. This method is more time consuming, but you can certainly get just as good of a quality edge. In this tool review, I show you some of the sanding tools that I use in my shop on a daily basis to sand my edges. These tools work great and the great thing is that most of them can be purchased on your next trip to the hardware store. Check out this video and see what tools you may not have thought of trying yet. If you are interested in adding “power” to your edge slicking process, then visit our friends at Leather Machine Co. and check out their Cobra MP Burnisher. If you are in the Waco, TX area and would like to play with one of these machines to see how it works, you can visit with Aaron Heizer with Maker’s Leather Supply. Their are a Cobra Machine Dealer and he is very knowledgeable about the products.